Mini 3dr Performance, Engine, Ride, Handling | What Car? The entry-level One uses a 1.5-litre three-cylinder petrol unit that needs working hard – something that can be tiresome on long journeys. 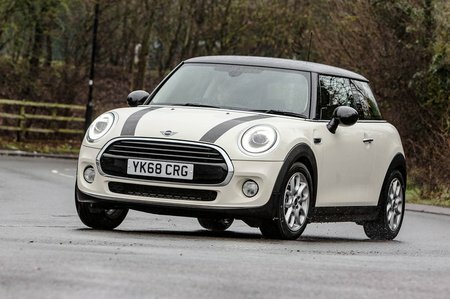 The next-rung-up Cooper gets a more powerful version of that engine and is our favourite in the line-up. It pulls strongly across the rev range without any of the annoying surges in power delivery that you often get with three-cylinder engines. The Cooper D’s 1.5-litre diesel engine isn’t quite as nippy on paper as the petrol Cooper, despite its 148bhp, but it still pulls strongly from low revs and is remarkably smooth for a small diesel. Unsurprisingly, it also nets you quite a few more miles to the gallon. The Cooper S's 2.0-litre, four-cylinder petrol delivers very impressive performance with a sporty-sounding exhaust note, but it pushes the price up considerably and can’t match the driving thrills provided by its Ford Fiesta ST rival. If anything, the bigger and heavier engine actually makes the car handle less sharply than the 1.5-litre Cooper. At the top of the range, there’s a performance-focused John Cooper Works hot hatch, which gets a more powerful version of the Cooper S’s 2.0-litre petrol engine and feels noticeably quicker than the regular Cooper S.
Every Mini feels pretty firm and subjects occupants to a lot of vertical movement over typically undulating British roads. Thankfully, well-judged damping stops the car from feeling like a pogo stick. In fact, the only time it gets uncomfortable is over a particularly vicious pothole or if you encounter mid-corner bumps at speed. Enter a typical town and you will find yourself jostled around a little on roads that a Volkswagen Polo would smother far more effectively. The Mini is affected a lot by the choice of wheels you go for; the 17in or 18in designs may look good, but won’t do the ride any favours and we recommend sticking to smaller wheels for the best ride comfort. If you’re tempted to splash some cash on big rims, consider the optional adaptive dampers. They provide a more pliant ride than the standard shock absorbers and can be flicked into a sports setting if you want a sportier drive. However, unless the latter applies to you 100% of the time, we recommend avoiding the fixed sports suspension: it’s far too firm for our liking. Mini’s trademarks have always included darty handling and a tight turning circle that helps with around-town manoeuvring. While this is still the case with today’s models, the march of progress has complicated things a bit, with Mini Driving Modes optional on all trims apart from the range-topping JCW version. The system introduces three variable drive settings that you can engage depending on your mood. In default mode, the steering is well-weighted and feels quick off the dead ahead, but can feel slightly nervous on the motorway and tends to self-centre a bit aggressively as you exit tight, low-speed corners. By contrast, the Sport setting seems unnecessarily heavy. 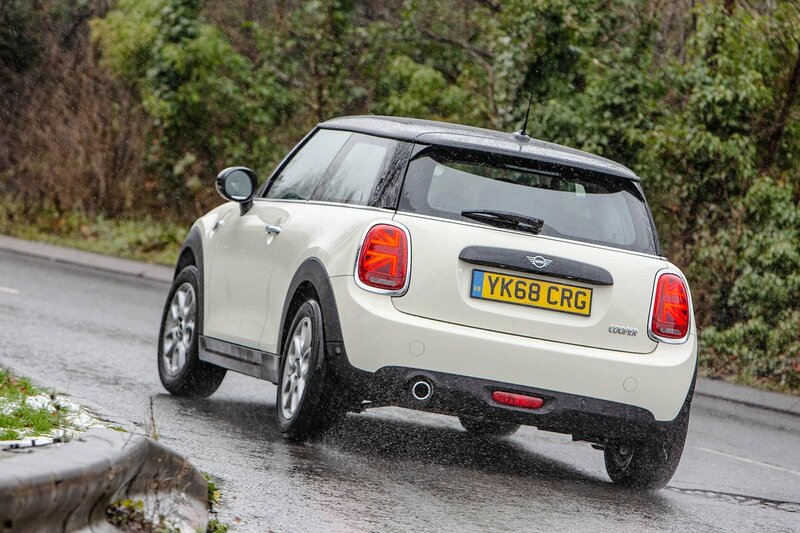 Corners are taken in true Mini style, with sharp turn-in and loads of grip. The Cooper and Cooper D actually feel a touch more nimble than the Cooper S, thanks to their lighter engines, but all will wash wide in a fast corner sooner than some might expect of a car with the Mini’s sporting pretensions. The Audi A1, for instance, actually has slightly more grip at the front and will resist scrubbing wide through a corner for longer than the Mini. The engines in the Cooper and Cooper D are remarkably refined; you feel barely any vibration through the steering wheel or pedals, and a muted off-beat thrum is all you hear unless you really put your foot down. That said, the Cooper D can get a bit gruff at higher revs. 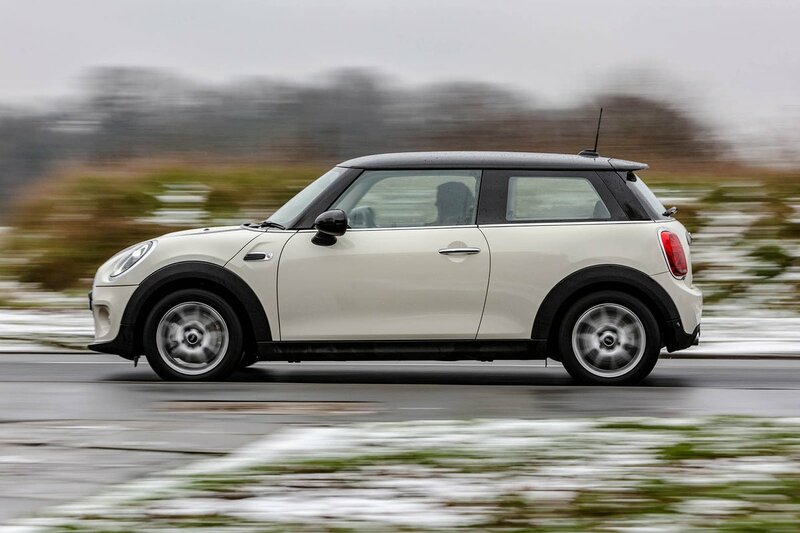 The Cooper S sounds suitably sporty, thanks in part to a system that directs engine noise into the interior. Wind noise over the windscreen and A-pillars is very noticeable at motorway speeds and is an irritating trait across the range. The standard six-speed manual gearbox is a bit notchy and has a heavier shift action than you might expect of a small car. However, the light clutch makes it easy to drive around town and is matched with accelerator and brake pedals that are appropriately sensitive and easy to judge. The Cooper S gets a rev-matching system to ensure the engine speed suits your chosen gear when you downshift. It works extremely well and makes for very smooth gear changes – even during hard driving. The optional seven-speed Steptronic double-clutch transmission is very smooth, providing slick shifts and coping equally well with smooth town driving and faster A-road trips. It’s available with all engines/trims, but adds a considerable premium to the asking price. An eight-speed standard automatic transmission is available on the hot JCW variant.